The Kobold King, in his scaly wisdom, became a patron of the famed cartographer, Dyson Logos (Fantasy RPG Cartography by Dyson Logos)! Magnificent maps were attained, thereby, which our Squamous Sovereign decreed would become part of the landscape of Midgard. With great celerity and a stolen thesaurus, one of his minions did set about transforming his liege’s will into stone, earth, wood, water, fur, flesh, bone, blood, and various pieces of tasteful and expensive furniture. Three plain, wooden doors exit this corridor, and a stone stairway leads down. A fourth door of a different, darker wood stands at one end of the hall; a small wooden tab is attached to the door about four-and-a-half feet up. This is the unconcealed back of a secret door for use by household staff, and the tab covers a spy-hole which provides a good view of Area 15. 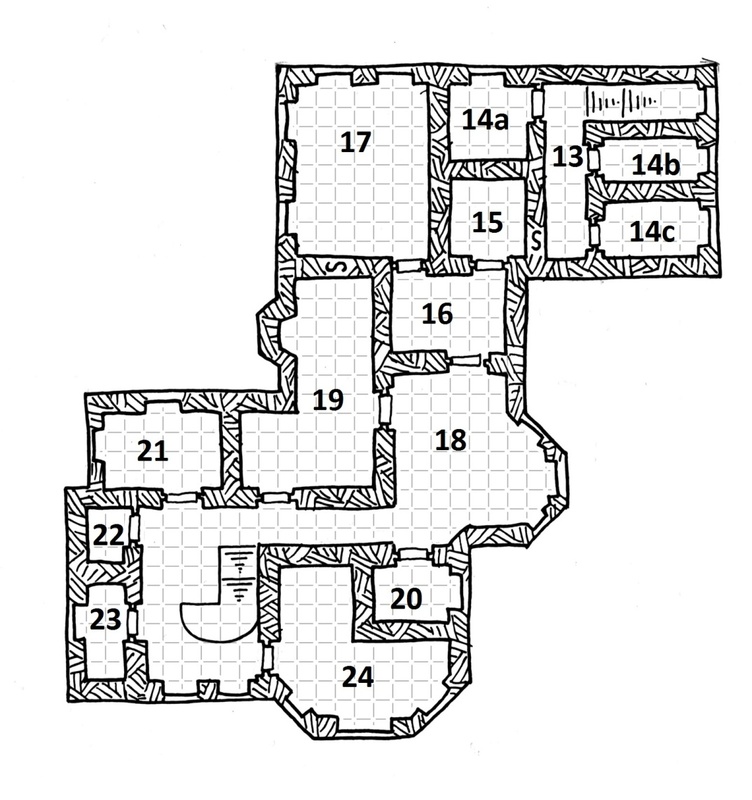 These rooms served as the living quarters of the manor’s household servants. Under a layer of dust and cobweb, the rooms contain plain but serviceable beds, empty oil lamps, some scattered clothing typical of domestic servants in the region, and odd bits of household cleaning supplies and implements; brooms, a couple of old mop handles, several wooden pails, and other such items. The walls of this room are lined with wooden bookshelves. A pair of deep, overstuffed leather chairs flank a small marble-topped table on an old bearskin rug in the center of the room. Three tall candelabras, placed to light the room evenly, support ages of dust and cobwebs, and the candles, barely recognizable as such, have all melted and bent with the passing seasons. A single door exits the room. 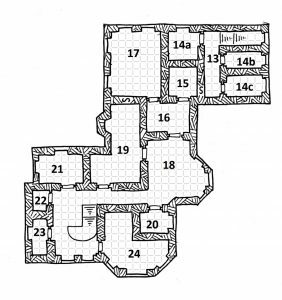 A secret door in one bookshelf (Investigation DC 18) leads to Area 13 and was intended to provide discreet access for the household staff to the rooms of the upper floor. The books on the shelves consist mainly of travelogues, truthful and otherwise, as well as a respectable selection of botanical texts that, when combined with the contents of the wooden boxes on another shelf, are sufficient to create a poisoner’s kit, an herbalism kit, or both. A PC searching the shelves with a successful DC 20 Investigation check discovers a hollow book entitled A Treatise on the Relative Merits of the Fodder Grasses of the Easter Rothenian Plains, Vol. II. The false cover conceals a smaller book with a cover of white leather of some kind, so smooth as to be slippery. The book, entirely in Elvish, is The Mistress of Air and Darkness, a sacred text of Sarastra, the patroness of the shadow fey. To the right collector, this book can fetch as much as 1,000 gp, but anyone connected to the Shadow Court or Sarastra’s priesthood might offer things far more intriguing than money for it. Failing that, such beings might resort to other means of getting it out of the hands of a mortal. Four portraits hang on the walls in this room. Three of the portraits depict young adults in parade armor, two men and a woman, all with black hair. The fourth portrait depicts a barrel-chested and bluff-faced man of late middle years with a great black mustache drooping to his jaw line. All of the figures bear an obvious family resemblance. The portraits are of the last mortal tenants of the manor, all killed on the grounds and dead now for over a hundred years and interred in the tombs below. The painting is quite skillful and could bring 100 gp per portrait from a collector with a discerning eye. This room is filled with old couches and various needlepoint projects, abandoned on the floor. A writing desk stands beneath one window, and a small wooden platform takes up a large part of the center of the floor, clearly a stage of some kind for recitals. All of the windows in this room are covered with long, thick, black cloth. Beneath the cloth, thick, clear leaded glass windows stretch near to the ceiling. The mounted heads and posed bodies of all manner of creatures cover the walls and take up a large part of the floor in this room. A large black wolf stands in one corner, its face frozen in a snarl; a pair of mountain lions crouch on either side of the central leadlight window. 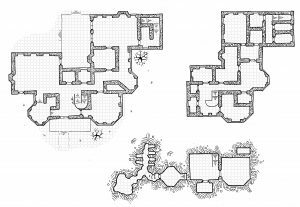 The heads of half a dozen stags, that of a bearded mountain goats, a bull elk of monstrous size, and what must be the head of a basilisk all stare down from the walls. An enormous white bear, perhaps ten feet in height, dominates the center of the room, its great maw frozen in mid-roar. Encounter. All but one of the creatures in this room are dusty but excellent examples of expensive taxidermy except for one: the bear. The bear’s hide conceals a clay golem which waits motionless for ten seconds before attacking any creature in the room. The golem can be kept from doing so by touching the top of the stuffed wolf’s head, which causes the golem to ignore any creatures in the room for five minutes. A DC 15 Perception check notices that the wolf’s head is smooth and hairless at the crest of its skull and merely painted black.